Usually when an historical event recedes into the past, people tend to regard it with greater objectivity. However, as World War II recedes into the past, Americans seem less able to view it objectively. Instead, the media in recent years subject us to bombast about the “greatest generation ever”. When I was young, people read books like Catch-22 and Slaughterhouse-Five, two novels that took a distinctly unsentimental view of the war. Nowadays, people swoon over sentimental trash like Saving Private Ryan, in which Tom Hanks sacrifices his life, so Matt Damon can go home to his Mommy and Daddy. I think one reason for the difference is that many people in my generation had fathers or uncles who served in the war. (My father was at the Battle of Bulge.) I think that connection made the war seem more real to us than it does to young people today. 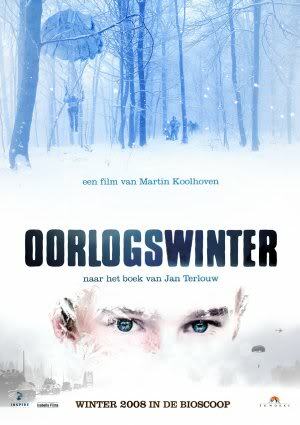 What set me to thinking about this lately is that I recently saw the Dutch film, Winter in Wartime, which was directed by Martin Koolhoven, based on a novel by Jan Terlouw. It takes place in a town in German-occupied Netherlands in January, 1945. Michiel (Martijn Lakemeier) has mixed feelings towards his father (Raymond Thiry), the town’s mayor, who tries to maintain a neutral stance towards the the Germans. He prefers his uncle, Ben (Yorick van Wageningen) who has ties to the resistance. When a British pilot, Jack (Jamie Campbell Bower) is shot down, a local member of the Resistance helps him hide from the Germans. Michiel soon learns of this, and he becomes obsessed with the idea of helping Jack escape back to Britain, even though this endangers himself and his family. In addition to being a war story, this is also a coming-of-age story, as Michiel’s illusions are eventually shattered. As World War II adventure movies go, this one is pretty good, although there are some things in it that I found hard to believe. When, for example, the resistance hide Jack, they put him in an underground hideout that is accessed by a wooden trap door with branches glued to it. It clearly looks like a trap door, yet we’re supposed to believe that the Germans, who are combing the woods looking for Jack, fail to see it. Maybe they just have bad eyesight. This film was released in the Netherlands in 2008. It was a huge hit in that country. Yet this film wasn’t released in the U.S. until spring of this year. Why is that? Could it be that nobody thought that people in this country would want to see a World War II movie in which the good guys are not Americans? This brings me back to the point I made at the beginning. It seems to me there is a reluctance in the media to admit that most of the war did not involve the “greatest generation ever”.